On April 13th a provincial court of Neuquén, in the Argentine Patagonia, will determine the charges for which traditional authorities of the Mapuche people who defended their territory against the exploitation of hydrocarbons will be brought to trial. On April 13th a provincial court of Neuquén, in the Argentine Patagonia, will determine the charges for which traditional authorities of the Mapuche people who defended their territory against the exploitation of hydrocarbons will be brought to trial. Both the Prosecution and the plaintiff request that Relmu Ñamku be prosecuted under the charge of attempted murder, while charges of aggravated damages were brought against the werken (spokesman) Martín Maliqueo and the lonko (community authority) Mauricio Raín. The facts date back to December 28, 2012. On that day, the community Winkul Newen resisted an eviction promoted by a subsidiary of the American company Apache-bought by the state-run oil company YPF in 2014. The legal action was aimed at the reactivation of the Portezuelo Norte field, located inside the community territory and stalled by the Mapuches a few months before. On that day, Verónica Pelayes, then court officer and current plaintiff of the case, was injured in the face after being hit by a stone. Ñamku is being accused of attempted murder for that incident. 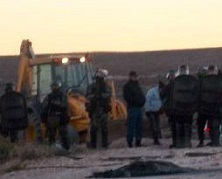 The backdrop of such events is the oil industry’s long process of encroachment upon the community territories under the auspice of the provincial state-who grants licenses-and carried out by different companies-such as the U.S. companies Pioneer and Apache in the past, and continued today by YPF’s subsidiary, Yacimientos del Sur. It is worth mentioning that this blatantly violates indigenous rights, since the hydrocarbons policies −both in the Neuquén province and at the country level− are carried out without the free, prior, and informed consent of the indigenous peoples concerned. For over a decade, indigenous and social organizations have been denouncing this state of affairs. Even the UN Special Rapporteur on the Situation of Human Rights and Fundamental Freedoms of Indigenous Peoples, James Anaya, issued a report in this regard after his visit to Argentina in 2011. We are sorry that the court officer was injured; we consider this resulted from the violence generated as a consequence of the denial of rights to the Mapuche people. During over a decade of oil industry’s encroachment, the Winkul Newen community has been exposed to harassment by the police and armed civilians, and even children and elders have suffered severe injuries. There was never any justice for them, nor any in relation to the violent environmental impact, which prevents the normal development of the Mapuche livelihood in their territories. As the Latin American chapter of the Global South Network Oilwatch, we consider that the mere chance that an individual be judged and sentenced for attempted murder as a result of defending his or her territory by throwing stones is a disproportionate measure. It is the consequence of a further attempt to strengthen the criminalization of social protest. The conviction of the accused would set a serious precedent. Thus in the future anyone could face the same charges for being part of a protest in which stones were thrown. We also wish to express our concern over the prosecution of the assembly members Horacio De Carli, Facundo Scattone, Bernardo Zalisñak, Francisco Larocca and César Arístides Pibernus for “hampering the normal flow of land transportation,” ordered by a federal court. In August 2014, in the city of Concordia, Entre Ríos province, socio-environmental assemblies prevented for several hours the crossing of four trucks carrying seismic prospecting equipment to Uruguay. The action was part of a struggle to protect the Guaraní Aquifer, in which organizations of both countries oppose hydrocarbons exploitation through the technique of hydraulic fracturing, or fracking, on one of the biggest fresh water reservoirs in the region. Also, we cannot fail to mention the case of the Las Heras oil workers, in the southern province of Santa Cruz-a clear example of the criminalization of social protest, in which it is clear that punishment seeks to guarantee the companies’ productivity. 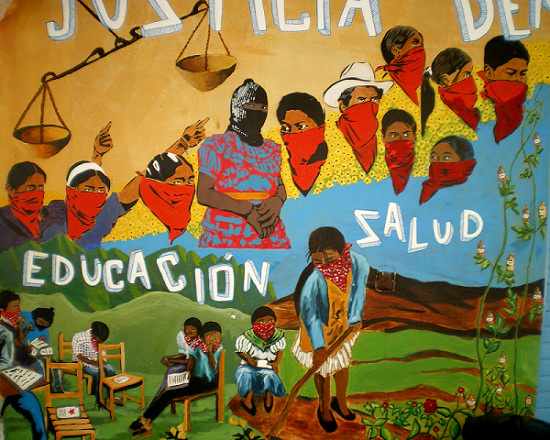 In December 2013, Ramón Cortez, José Rosales, Franco Padilla and Hugo González were sentenced to life imprisonment for the death of policeman Jorge Sayago, which occurred in February 2006 when workers and the police confronted each other in the context of a long strike against labor precariousness and income tax. The decision, condemning also six other workers to lesser sentences, was appealed by the defense, who denounced that the incriminating testimonies were obtained under torture. From Oilwatch Latin America we wish to express our solidarity with those who defend their territories against the expansion of the extractive frontier, and are currently facing criminalization. We also support the demands for the acquittal of the Las Heras oil workers. We urge the Argentine authorities-especially the Government of Neuquén-to safeguard the fundamental rights of the Mapuche People. Furthermore, we urge the Argentine authorities-and particularly the Government of Entre Ríos-to guarantee the preservation of the Guaraní Aquifer. Primeras adhesiones. Argentina: Adolfo Pérez Esquivel, Premio Nobel de la Paz; Félix Díaz, qarashe comunidad Qom Potae Napocna Navogoh; Alberto Binder, vicepresidente del Instituto de Estudios Comparados en Ciencias Penales y Sociales (INECIP); Antonio Gustavo Gómez, Fiscal General de Tucumán; Maristella Svampa, investigadora del CONICET, socióloga; Enrique Viale, Asociación Argentina de Abogados Ambientalistas; Bercovich, Alejandro periodista y economista; Belén Alvaro, docente e investigadora de la Carrera de Sociología, Universidad Nacional del Comahue; Fernando Stratta, sociólogo, docente UNLa / UBA / UNSAM; Miguel Mazzeo, escritor, docente UBA y UNLa; Lic. Juan José González, profesor jubilado de la Universidad Nacional del Comahue; Alexis Papazian, profesor de historia y doctor en Antropología UBA; Hernán Moreno, concejal de Zapala (PS); Herman Schiller, periodista; Lucila Matteucci; Equipo Pueblos Originarios – SERPAJ; Secretaría de Pueblos Originarios – Asamblea Permanente por los Derechos Humanos (APDH) Nacional; APDH Neuquén; Mesa de los Pueblos Originarios de Capital Federal y Provincia; Colectiva Feminista La Revuelta; Sin Cautivas, Feministas por la Resistencia; Fundación Ecosur. 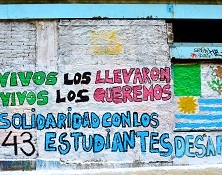 Ecología, Cultura y Educación desde los pueblos del Sur; Frente Popular Darío Santillán – Corriente Nacional; Red de Investigadores sobre Genocidio y Política Indígena; Diálogo 2000 – Jubileo Sur Argentina; Foro Ambiental y Social de la Patagonia – Comodoro Rivadavia; ONG Alerta Angostura; Patria Grande; MST Nueva Izquierda – Neuquén; Red Ecosocialista – Neuquén; Red Ecosocialista – Santa Cruz; Partido Socialista Distrito Neuquén; Emancipación Sur Neuquén en el Frente Popular, Emancipación Sur Corriente Nacional, Asamblea de Bariloche contra la Megaminería; Prensa Latina Argentina; Asamblea Permanente del Comahue por el Agua (APCA), Partido Comunista de los Trabajadores. Brasil: Prof. Dr. Sebastião F. Raulino, Faculdade de Filosofia, Ciências e Letras de Duque de Caxias – FEUDUC (Brasil); Jamila Rodrigues Venturini, periodista; Rede Brasileira de Justiça Ambiental (RBJA) Brasil; Toxisphera Associação de Saúde Ambiental (Brasil); Associação de Defesa do Meio Ambiente de Araucária (AMAR); Associação de Proteçãoao Meioambiente de Cianorte (APROMAC), Fórum dos Atingidos pela Indústria do Petróleo e Petroquímica das cercanias da Baía de Guanabara (FAPP-BG); Campanha Por um Brasil Livre de Fracking; Associação Nacional dos Servidores da Carreira de Especialista em Meio Ambiente e do PECMA (ASCEMA Nacional); Associação dos servidores do IBAMA – Rio de Janeiro (ASIBAMA RJ). Chile: Andrés Figueroa Cornejo, periodista. México: Comité Cerezo.